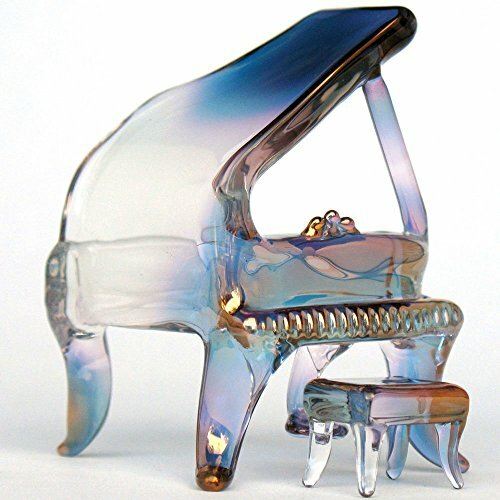 Hand blown glass piano figurine just might be the most grand of your collectible piano sculptures. Kevin Prochaska, Disneyland glass blower for 10 years is the artist. For pianists and piano collectors, this is sure to be an unusual find since although it is made of solid glass, it is not machine molded. Instead, I shape it entirely by hand from borosilicate crystal and accentuate its graceful bends with the colorful application of 24k gold. To create the vibrant rainbow of colors, pure gold is heated to the point of vaporization and applied to the glass while the sculpture is still molten. As the son of a piano teacher and the brother of an accomplished pianist, I grew up surrounded by musical instruments including a baby grand piano and two uprights. Piano measures approximately 3 inches tall, 2 inches wide and 2 inches long. Bench is also made of solid glass and measures approximately ¾ inches tall, ¾ inches wide and ½ inch deep. This is one of my favorite works and I think it will bring years of enjoyment to that special music lover. Your purchase includes a lovely information card trimmed with gold foil.